Originally published in the Grand Island Independent on Sunday, March 30, 2014. Story by Ellen Campbell. Independent / Matt Dixon Luke and Lori Jacobsen pose for a portrait with some of their grass-fed cattle in a pasture on their farm near Marquette. The Jacobsens’ beef products have been sold all over the United States and can be found online at rangewestbeef.com. MARQUETTE — Many people believe grass-fed cattle produce a tough, stringy product, and that good beef comes only from corn-fed animals. Luke Jacobsen, who farms near Marquette, is proving that, given the right conditions, the opposite is true. His wife Lori, who is a first-grade teacher, helps with their beef business, especially the marketing. They live on the L&L Jacobsen Farm, where they raised their three children. The kids live away from home now, but assist on the farm when they are visiting. 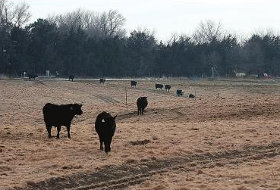 “I come from a long line of beef producers,” said Jacobsen. “My great-grandfather Peter Jacobsen immigrated to the United States from Denmark in 1868. He came to Nebraska in 1872 and settled in the Marquette area in 1892. He was a cattle farmer, and sold his animals at the Omaha Stockyards. 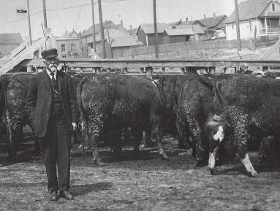 Courtesy photo Peter Jacobsen, great-grandfather of Marquette farmer Luke Jacobsen, sold his cattle at the Omaha Stockyards. Photo was taken in the late 1800s or very early 1900s. Then there were the next two generations. 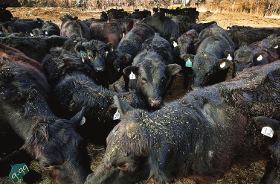 Jacobsen said he became interested in grass-fed cattle from the health standpoint. Grass — not corn — is the natural diet for ruminants like cattle, and the meat from these cattle provides three times more omega-3 than those that are grain-fed, twice the amount of beta carotene, less saturated fat and fewer calories per serving. 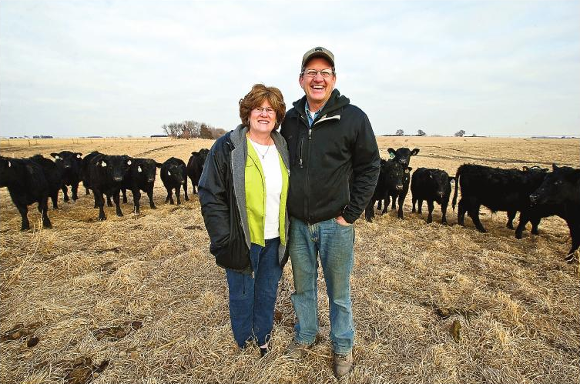 The Jacobsens use no antibiotics or synthetic hormones in their cattle. “I took a trip to Argentina in January of 2003,” he said. “They grow excellent beef there on the Pampas plains, and I was with a group that wanted to counter the corn-fed theory. We learned that Argentine cattle genetics are different from ours, producing animals with a smaller frame. Also, with abundant rainfall, the pastures have a high moisture content, and the grazing is rotated. Independent / Matt Dixon These cows, and many others raised by Luke and Lori Jacobsen on their farm in Marquette, are raised on a pure grass diet. Back home, Jacobsen began his experimentation with a small part of his 80-acre home place, and now uses all of the property. He has divided the pasture land into a number of different paddocks, and rotates the cattle through, giving each plot a 30-day rest period before another herd comes in. In addition, the pasture is irrigated to emulate the wet Argentinian Pampas. He has also focused on genetics for cattle that are smaller-framed than the typical beef animal. “We feel our flavor is superior to corn-fed beef,” he said. “And one reason is that the animals are older before being butchered. In earlier times, cattle were not sold until they were about 2 years old and had time for their meat to develop more taste. 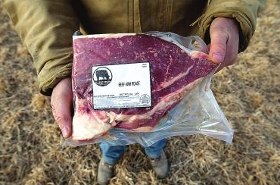 Independent / Matt Dixon Grass-fed beef arm roast is one of the beef products sold by Luke and Lori Jacobsen. Luke Jacobsen recommends a book — “Steaks,” by Mark Schatzker — as an excellent source of information about the benefits of feeding cattle on grass. The Range West website has a link to a video of an interview with the author. In this interview, Schatzker mentioned Range West, and it brought numerous inquiries and orders to the Jacobsens. Independent / Matt Dixon Pictured are some of the grass-fed cattle raised by Luke and Lori Jacobsen on L&L Jacobsen Farm near Marquette. The Jacobsens have customers all over the United States, as well as a wide constituency of people in Asia, Europe and Africa who don’t like the American corn-fed beef. “One of our problems is keeping up with the demand,” said Jacobsen. “We’re a small operation and can turn out only a certain amount of beef at a time. “A frequently asked question is ‘Why can’t I find grass-fed beef in grocery stores?’ The answer is that American food production is geared for high volumes of basically wholesome, inexpensive food with little regard for nutritional differences. Feeding grain is the fastest way to fatten animals and has been the least costly. But our customers are concerned about availability, not price.